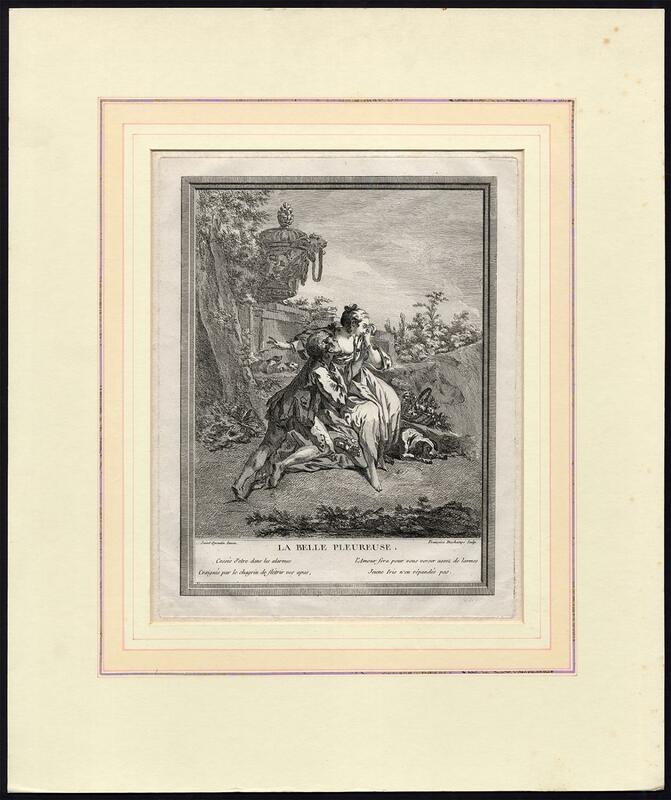 - Rare antique attractively matted print, titled: 'La belle Pleureuse', ('The Beautiful Mourner'), shows a seated crying lady with her sleeping dog at his feet, being consoled by a young man. Etching on a verge type handlaid paper. Description: Separately published master print, ca. 1750. Our definition of a Master Print is a seperately published print or series of prints, not being an illustrative print to a text. These can both be prints made by old masters (artists) or prints made by others (artists, engravers, etchers) after old masters.Artists and Engravers: Engraved by Francoise Deschamps after Saint Quentin. Francoise Deschamps (1738-1769) was a French engraver of some skill. She was married to Beauvarlet. Jacques Philippe Joseph de Saint-Quentin (1738-c. 1785) was a French artist, best known for his painting 'The Death of Socrates'. Condition: Very good, given age. A trifle soiled around the platemark. General age-related toning and/or occasional minor defects from handling. Please study scan carefully. Profesionally matted, not examined out of matting. Storage location: DPO78-09 The overall size is ca. 18.1 x 21.7 inch. The image size is ca. 10 x 13 inch. The overall size is ca. 46 x 55 cm. The image size is ca. 25.5 x 33 cm.